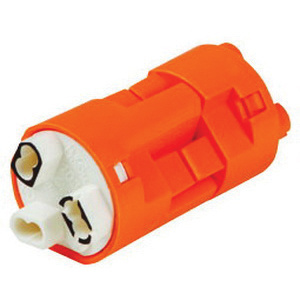 Ideal Industries PowerPlug™ Luminaire disconnect in orange color, fits through 1/2-Inch knockout. It features nylon construction Disconnect with 3-Wire terminal connection, has voltage rating of 600-Volts. It has a dimension of 0.74-Inch Dia x 1.48-Inch. It withstands temperature rating of 221 deg F. It has V0 flammability rating per UL 94 to withstand harsh environmental conditions. Luminaire disconnect is UL listed and CSA certified. * Inventory displayed is accurate as of 04/23/2019 17:40 EDT.